There are many ways to take advantage of the rich set of collaboration tools provided by Microsoft Skype for Business. IT leaders should consider a cap-and-grow Skype for Business strategy and then think through how it can be leveraged as a replacement technology. 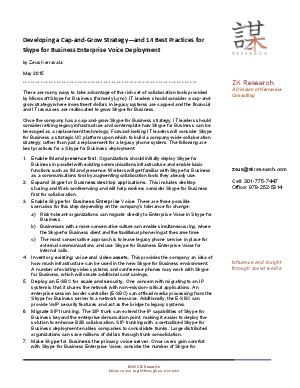 Digest this white paper by leading UC analyst Zeus Kerravala for insight on the 14 best practices for a Skype for Business Enterprise Voice deployment. Enabling IM and presence first, expanding desktop applications, and more are details in this informative piece.